The ArtStarts AGM was held on May 12, 2017, attended (both in person and by teleconference) by members of the Board of Directors, society members and staff. 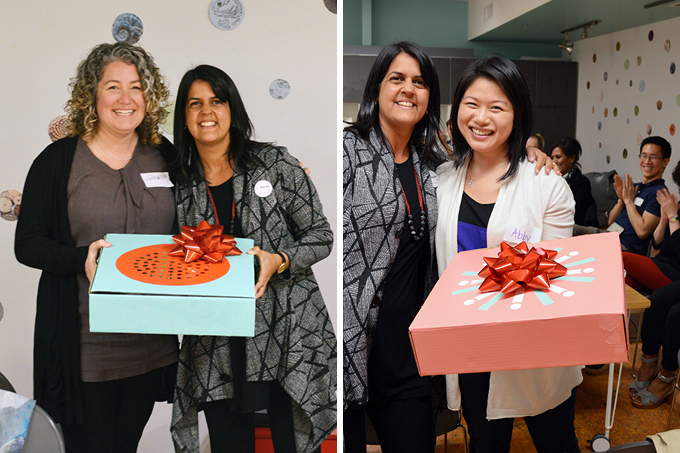 It was bittersweet to say farewell to Board President Lynda Gerty and Treasurer Abigail Ma. We sincerely thank them for their years of service on the Board. They have demonstrated strong leadership and an admirable commitment to building an effective team. Their passion for arts in education has helped moved ArtStarts' mission and vision forward, resulting in a positive impact on young lives. We wish Lynda and Abby all the best as they begin their new adventures. The following officers were appointed: Stephen Petrucci as President, Wilson Cheung as Vice President, Mia Lok as Treasurer, and Will Stroet as Secretary. Amyn Somani, Thara Vayali, Mary Blais and Tina Parbhakar were elected at the AGM. We welcome these talented individuals to the ArtStarts Board and are excited to work together in the coming years. ArtStarts' Annual Report 2016 was presented at the AGM. The past year was a milestone for our organization, as we celebrated our 20th anniversary. As we read through the Annual Report, including many letters and testimonials from real teachers, artists and families who have reached out to share their personal experiences, we were reminded that, more than anything, we are proud of the lasting impact that our programs and offerings have had on young people across British Columbia. Of course, we could not have accomplished so much in 2016—and over the past 20 years—without the involvement and support of our community. We thank our funders, donors, supporters, as well as our communities of teachers, artists, families and young people that we collaborate with every day for being an important part of our growing alliance of advocates for young people.